Keep the fun and excitement rolling as Rob Evans introduces the Donut Man to a new generation. Live action video, great songs and lyrics fo kids to sing along will keep kids laughing, singing and learning. Help kids discover that life really can be an adventure when you share the good news about God's love. In the DONUT HOLE - kids learn the good news about God's love as they join the Donut Repair Club Kids to sing songs, tell Bible stories and "repair" a few donuts. In the DONUT HOLE 2 - The Donut Man and his sidekick, Duncan, are hard at work on their new invention - the Handy-Dandy Donut Repair Machine. But when things don't go as planned, there's just one thing to do: Call a meeting of the Donut Repair Club! Their mission: Tell people about Jesus! 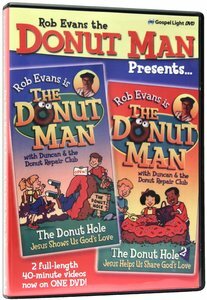 About "Rob Evans, the Donut Man, Presents the Donut Hole & the Donut Hole 2"
Customer Reviews For "Rob Evans, the Donut Man, Presents the Donut Hole & the Donut Hole 2"
I first purchased this (as a video) about 25 years ago for our kids. They loved it and we did too. Our kids are now adults and over the years they have continued to talk about 'The Donut Man' video, it has had a very big impact on them, they remember the songs and so do I. Ours is on video and just sitting there now, so we had to buy the DVD so our grandkids could have the same enjoyment and learn songs sung from scripture. So pleased it is now available on DVD. Just love it!